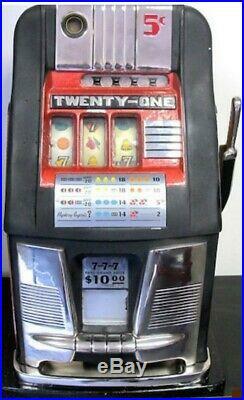 Antique slot machine, circa 1950. Manufactured by Mills Novelty Company, this is a "Twenty-One" Hi-Top deisgn with coin escalator and jackpot payout feature, in a 5 cent denomination. This machine is in good working condition. There are a few scratches and scrapes on the finish as to be expected by a 65 year old machine, but overall in good condition. Measurements approximately 26" tall x 14" wide x 13.5 deep. We only have one of these available, so when ordering this item, you will receive the exact one pictured. The item "Five Cent Mills Antique Twenty One Hi Top Slot Machine Circa 1950Jackpot payout" is in sale since Sunday, March 3, 2019. This item is in the category "Collectibles\Casino\Slots\Machines\Antique Coin Slot Machines". The seller is "trends_and_treasures" and is located in Evans, Georgia. This item can be shipped to United States.